3rd year Jazz Piano Major at Brandon University. Shirley Craig Scholarship for Saskatchewan students ($2000 dollars, 1st, 2nd, and 3rd year). In 2006/2007, I was involved with a Christian missions organization called “LifeForce.” The program was 8 months in length and included 3 months of spiritual training/education, followed by a 5-month mission to the United Kingdom. While overseas, a team of myself and 7 others visited over 25 schools and spoke to nearly 15,000 young people, addressing common issues that teenagers deal with while sharing our beliefs in our faith in God. I have been heavily involved in my church/church music ministry since I was 11. Prairie born pianist and vocalist Miranda Young originates from Regina, Saskatchewan. Her keen interest in music began at the age of 5 followed by several years of classical study through the Royal Conservatory of Music. During this time Miranda became heavily influenced by Top 40 and Pop styles and later, several forms of jazz. Influences include Chantal Kreviazuk, Sarah McLachlan, Bruce Hornsby and Diana Krall among others. She also spent much time performing and composing under these influences. In 2003 Miranda recorded ‘Forever One’ in Caronport Saskatchwan, a single which would be re-released on an 8-track demo album recorded by the talented Jared Robinson at Nebulus Entertainment. She was featured on local Nebulus artist compliations “A Nebulus Christmas” (2006) and “This Christmas” (2007). 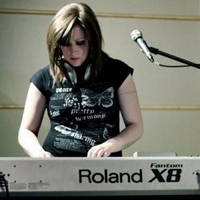 Shortly after, Miranda started playing keyboards/back-up vocals with Sask-based country artist Erin Fleury and the ‘Erin Fleury Band’ until January of this year. As of recent, she has been playing for one of BU’s own, the talented Jessica Moskaluke. Currently, she studies Jazz Piano with multi-faceted performer/composer/educator Michael Cain at Brandon University in Brandon, MB, while keeping busy in several academic ensembles and small groups. Within the last year, Miranda is exploring a new role as Keyboardist/Keytarist/Vocalist in Brandon’s newest party band, Keytar Hero. Born January 18,1988. Age 22. Born and raised in Regina, Sk into a non-musical family of 6. Heavily involved in music in my High School (Balfour Collegiate in Regina) and continued to find every opportunity to perform, sing, play, act, etc. Have been teaching privately since September. My field of study was the obvious choice for me. I felt that I would regret it if I did not learn the skills that it takes to play this complex genre of music we call “Jazz.” Maybe I will go on to play jazz. Maybe I will be a country musician for the rest of my life. No matter where the future takes me, I feel at ease knowing that I went back to the root of music and learned the core skills needed to be a well-rounded musician. My philosophy in life is always changing. It was one thing when I was 12, a different thing when I was 18, something new at age 22, and will be completely different when I am 60. Right now my philosophy involves hard work for continual personal development and love for people, all in the name of whatever supernatural being it is that put us here. I call him God. I hope that my future is fruitful and fulfilling. I see myself teaching music, playing and performing, but I also hope to be blessed with the opportunity for marriage and children. A healthy balance of the two would be perfect for me.